If you're the passenger on a motorcycle, you might not be as familiar with all the mechanics and techniques of riding. A passenger who moves at the wrong time or in the wrong way can cause a serious accident. The best way to avoid a crash is to prevent it from happening. By knowing the right way to ride, passengers can help everyone stay safe and maintain control. We've put together this list to keep your rides safe and accident free. Well we definitely want to protect ourselves in the event of an accident, so we want to make sure we have a proper motorcycle jacket. We have both textile or cadora type jackets, we have leather type jackets. Now-a-days these jackets have built-in panels. Some come with actual armor, as well as a summer gear and they're all made of reflective materials. It's going to really help with your safety at night. How about pants Hal? I mean is pants a safety issue involving pants at all? Does it matter what you wear? Certainly, we want to make sure we wear a long pants of some sturdy materials. It's not only going to protect you in the event of an accident but also protect you against the hot parts of a moving motorcycle as well. I see people every once awhile wearing shorts. You wouldn't advise somebody to be wearing shorts riding a motorcycle? Certainly not, we want to make sure we have everyone properly outfitted. Let's head this way and I'll show you some other gear that we recommend for all motorcyclists. Now the other important piece of gear you want to have, you want to make sure you have proper footwear when riding a bike and these are made specifically for motorcycling. A lot of them have a great oil resistance sole on them, so when you put your foot down at a stop, you're going to make sure the bike is stable. This is also going to protect you again in the event of an accident or again, make sure you have a nice comfortable sole to ride. It's going to improve your safety. Do they have steel tips or is there something, I mean there's very sturdy. Yeah many of these have a steel toe in it. You'll notice some are lace-up and some are just a slip-on, so again we always go for comfort first which leads to safety. Good ankle support, I know is a important factor in the shoes, isn't it? Again, yes it is and also this will protect you against the hot parts of the motorcycle as well as opposed to wearing a tennis shoe or a flip-flop out there. You definitely want something that is going to protect your foot, provide you with comfort which leads to increased safety. Hal, a common injury we see is, bad hand injuries after a bike accident. Yeah and that's often overlooked by the average biker, is proper hand protection. We have a variety of gloves made specifically for motorcycles. We're going to have the pre-curved fingers, which will help improve your feel on the bike. There's also reflective material built into them and we applause for the winter better electric as well. In Pennsylvania we know there's freedom of choice with regard to wearing helmets, but let's talk about helmet safety. Yeah there are exemptions to having to wear a helmet here in Pennsylvania, but it is our number one recommended piece of safety gear. Regardless if you're traveling state lines, realize those laws can vary from state-to-state. You want to make sure you're in compliance wherever you're riding with the local laws. And I think if you're worried and want to know what the laws are from state-to-state with the helmet laws, they could refer to our website edgarsnyder.com and be able to get that type of information as to what the laws may be. No matter what make sure your helmet is a DOT approved helmet. Now we know in Pennsylvania eyewear is mandatory. Now this helmet has integrated eyewear. That is correct and you'll have motorcycle helmets that have the visor built-in. You can also have sunglasses, there are sometimes drop-down visors within the newer helmets that provide you with the sun glare or you can go with a safety goggle. Something of this nature. It's important to remember regardless if you have a windshield or not, you are still required to wear separate eyewear. 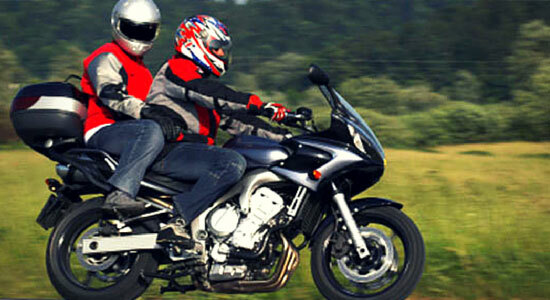 If you're not a seasoned rider, then you might not know the right attire for your ride. Showing up in flip-flops and pair of shorts is a big mistake. Make sure you have on long, sturdy pants or jeans, a durable jacket with long sleeves, and closed-toe protective footwear. Always wear a helmet, and make sure that it fits snugly to your head. Wearing gloves can keep your hands safe in the event of a crash as well. Ask the driver about how to dress appropriately for the temperature. They can give you some insight into dressing for warm and cold rides. You don't want to sacrifice protection just because you're hot. Here's a great list of what you should wear on your next motorcycle ride. New passengers might not know about the footpegs on the back of a motorcycle. These are where you securely place your feet for the duration of the ride. At no point should you ever take your feet off the pegs while the motorcycle is in motion. You might feel tempted to help the driver maintain balance while stopped, but taking your feet off the pegs could lead to leg burns from the exhaust, getting your foot caught in the drive chain, or worse. Keep your feet on the pegs until you're ready to dismount. Motorcycles, much like airplanes, lean or bank when they turn. Newer passengers might not be familiar with this sensation, so it's important to know how to handle banking turns. Always keep your body centered in the bike and in line with the driver. If he or she is banking right, look directly over the drivers right shoulder. If they're banking left, look over the left shoulder. This will keep you lined up with the driver and help them maintain balance through the turn. Never attempt to lean out of the turn, as it could cause the driver to lose control. When you're seated behind the driver, the best place to put your hands would be on his or her hips. This allows you to understand the driver's shifting weight and helps you to mimic that weight transfer. Don't be shy. Ask the driver what they prefer and be comfortable with your hand placement. It's important to feel safe while you're riding. 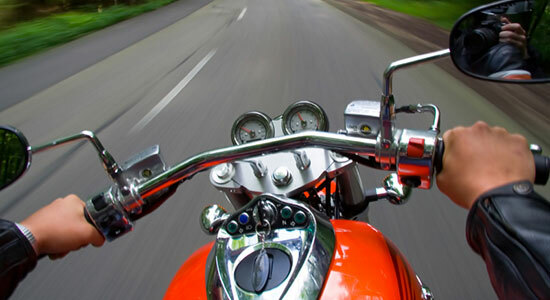 When you're riding along, you should constantly be scanning for any potential dangers. After all, your driver is focused on the road. Be an extra pair of eyes and look out for any wildlife or other obstacles that may pose a threat. If you see a deer lurking in the woods or a dog running from a front yard, gently tap the driver on the shoulder and point to the possible danger. By acting as a lookout, you can help make your ride safer. When you know how to ride along with someone else, you can have a safe and enjoyable time. However, sometimes accidents happen. If you or a loved one is ever injured in a motorcycle accident, contact our legal professionals for a free consultation. We can help you get the answers – and legal help – you need. We're standing by 24/7, and there's never a fee unless we get money for you.